steel that performs the same as the M2. Large new profile catalog. Take a look! Online payments are now accepted. email you an invoice to pay online. corrugated and W&H/Shop Fox style. moulders. Cost is 22.00 per inch of steel. you, but we do not supply gibs. received. Current lead time will be displayed at the top of this page*. Just click "Contact Us" if you have any questions or comments. without notice but will be updated from time to time. We strive to get all orders processed in a timely manner. minimum and also keep costs low. 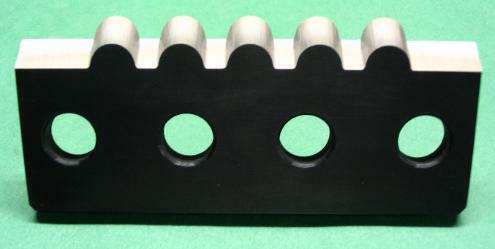 We are proud to offer Black Nitride steel. standard M2-HSS for only 20% more in cost. harder than M2 but do not want to spend a fortune for it. Price for this incredible steel starts at just 24.00 per inch of steel. Need Carbides? Milling MDF? Please Inquire. Black Nitride (High Grade)- From 24.00 per inch of steel needed. times. Most value for the money!! 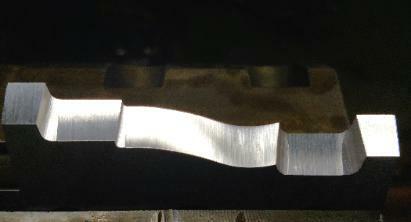 This is the best all around steel we have ever made knives from (customer favorite. for larger molders as well. Premium V2- From 19.50 per inch of steel needed. on the market. Great for most long runs of softwoods and hardwoods. premium steel will have a price somewhere between the V2 and M2 price. You will be directed to our other website with same catalog. of the art equipment in order to get you the best results possible. to email you an invoice. 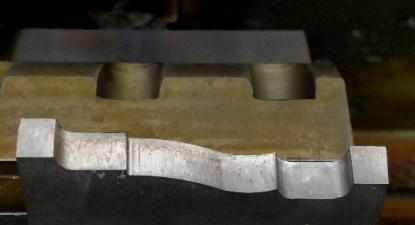 see the detail up close before we make the actual knives. made on water jet sent to us for "repair". Grinder (with side reliefs added to reduce friction). Price per inch for 5/16"